... and the Convent of St. Mary. ... bringing aid, comfort and hope to "the least of these" -- those who have been the victims of systemic poverty and are now the victims of this natural disaster as well. "In a ruined country whose government has all but stopped functioning in a city whose crowded shanties remain far from the cargoes of aid that are flying into the airport, someone has to fill the gap. In this part of the captial city, it falls to the church." 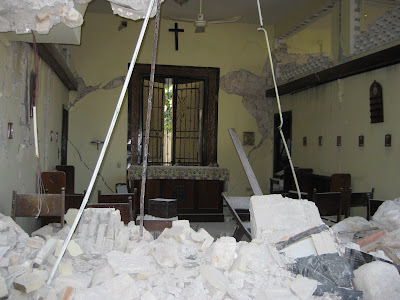 Watch the four minute report here ... and then donate below to the Episcopal Relief & Development Haiti Fund. 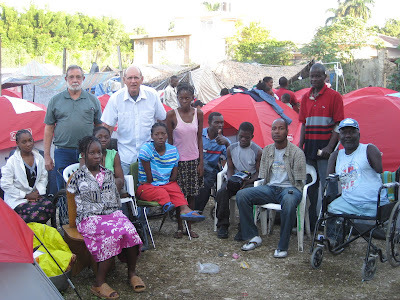 Be part of making God's love tangible to our human family siblings in Haiti! Click here to donate to the Episcopal Relief & Development Haiti Crisis Fund -- or visit the Action Table on the lawn on Sunday! All Saints Church rector Ed Bacon will guest on the Eisha Mason program on KPFK 90.7 today -- Martin Luther King Day at 2pmPacific. Tune in (in the Los Angeles radio market @ 90.7FM) or log on here to listen live. 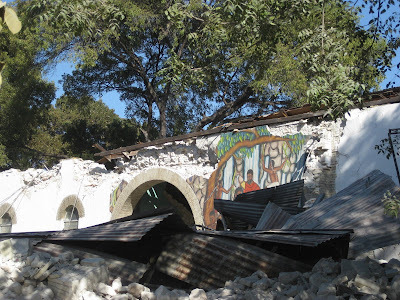 Haitians pass destroyed buildings on January 13, 2010 in Port-au-Prince, Haiti. Planeloads of rescuers and relief supplies headed to Haiti as governments and aid agencies launched a massive relief operation after a powerful earthquake that may have killed thousands. The first cargo planes with food, water, medical supplies, shelter and sniffer dogs headed to the Western Hemisphere's poorest nation a day after the quake flattened much of the capital of 2 million people. Relief efforts are ramping across Southern California. All Saints Church in Pasadena will work through the Episcopal Relief and Development foundation to funnel aid to the country, said Keith Holeman, All Saints church spokesman. "We'll be sending out an e-mail blast to all parishioners today, urging them to donate online today to our partner on the ground in Haiti, Episcopal Relief and Development -- or to bring a donation on Sunday," he said. 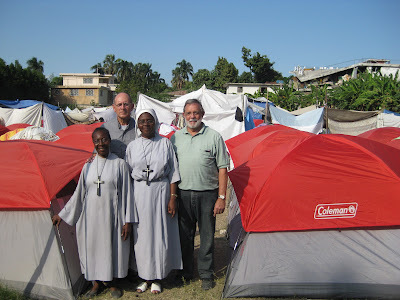 Holeman said cash donations are preferred in this case since the Episcopal Relief and Development foundation is on the ground ready to assist people in Haiti. On Tuesday, January 12, Susan Russell (All Saints Church) and Rick Jacobs (Courage Campaign) were interviewed by KPFK radio's Sonali Kolhatkar about the landmark trial challenging the constitutionality of Proposition 8. Listen here for a wide-ranging discussion on the political and theological implications of this important case ... and stay tuned to the All Saints Church News Blog for updates as the case proceeds through the courts! PASADENA [source link] - Lydia Wilkins was the life of the party at her 106th birthday celebration. Dozens of friends, family members and fellow church members gathered around her to celebrate Friday at the All Saints Episcopal Church in Pasadena, where she has been an active member for decades. "I feel great to have even lived this long," Wilkins said with a smile. The church celebrated her birthday Friday, although Wilkins turns 106 on Tuesday. Wilkins' daughter, 76-year-old Marjorie Jones, said she and other family members were not surprised to see the energetic matriarch live well past 100. "I call her the Energizer Bunny," she said. 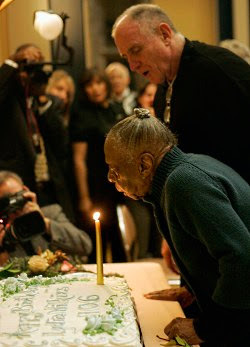 When asked how she managed to live to 106, Wilkins said, "I have no secret." Wilkins, who was born and raised in East Orange, N.J., moved to Pasadena with her late husband, William Wilkins, in the 1930s when he became a priest at the St. Barnabas Episcopal Church, family members said. She previously studied education at Temple University in Philadelphia before working as a school teacher. Wilkins' grandson, Wendell Jones, said his grandmother has seen a lot in her long lifetime. "It's amazing, at 106, when you think about what history she's been witness to," he said. "A man on the moon, two world wars." "She learned to drive on a Model T," Jones added. "She was driving until she was 100. We had to talk her out of buying a new car." Jones said Wilkins broke her hip 18 months ago and astonished the family with her quick recovery. "Literally, the next week, she was up walking," the grandson said. She still enjoys her sherry, he added. Wilkins spent the evening chatting and taking pictures with friends before blowing out the candle on her birthday cake to loud applause. Church member Jane Karageorge said she joined the church in 1979, when Wilkins was working as an usher at 86 years old. "She's just wonderfully engaging to all of us," Karageorge said. "Everyone in the church knows Lydia. She knows a little story about all of us."